Though lemon curd or any other fruit curd is very popular among the western countries but not here. We don't use this often but one thing very common between the western fruit curd & our local coconut egg jam is both cooking with eggs. The only difference is the cooking time. Coconut egg jam needs longer cooking time to give better texture while fruit curd is in the opposite. And here's what I have done to all my leftover fruits. (1) combine eggs, sugar & juices into a saucepan and mix well. (2) then place saucepan into a double boiler and let to cook untill thickened. (3) keep stirring the mixture and make sure it didn't stick to the bottom. (4) finally stir in butter and lime & lemon zest, whisk till everything is well combined. (5) leave mixture to cool once it's ready. (1) combine strawberry puree, lemon juice, sugar, cornflour & eggs into a saucepan. (2) cooking method follow as the above. The strawberry sauce is just looking so delicious...i need to try it!!! I love the idea of the strawberry curd. I still have lots of strawberries left from when I went strawberry picking (in the freezer). I may try this. Yum, I love lemon curd and make it often when my lemons are in season. The strawberry curd and lemon-lime curd sound wonderful Kristy! 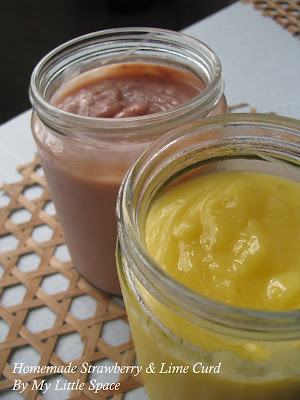 Can you freeze fruit curd? I've seen lemon curd before but never strawberry curd and it looks really awesome! Am definitely trying this out soon! 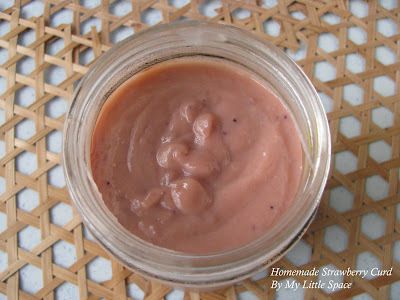 i've never seen strawberry curd...but I love lemon curd! nice addition of lime! Both the fruit curd looks delicious, should be very yummy for puff pastry too. it looks very nice... i like lemon! Never had strawberry curd before. Will have to give this a go in summer. I just cooked some lemon curd recently as filling for macarons, first time seeing strawberries curd though...wonder how is the taste? they both look and sound delicious. I bet they're perfect spreading on bread or toast! OR, like my little boy who loves to eat the curd with a spoon! hahaha...can't wait to make some strawberry ones! Thanks for sharing. Ana Rita : Hope you will like it too! Lyndz : I have yet tried freezing mine! I wonder if they're still good after frozen! Divya : Thanks very much, dear. Janine : Thanks & I'm sure you will like it. Ann : I personally think lime curd taste much better. 鱼鱼 ： Whoa... what a compliment! Really appreciate it. Thank you so much. Anncoo : Ya, exactly! Thank you very much for your kind words. Amelia : Have yet tried them in puffs! I believe they'll taste great too. Fiza : Hi there, welcome dear. Glad you like it too. Hoe to hear from you more often. Penny : I'm sure you will like it too! none : Strawberry curd tastes like in between lemon & strwberry flavour jam. Curious!!! Amy : haha... well then, he might just finish off all! Diane : Cool, this reminds you of your mom! Thank you very much for spending your time here with me today. Hope you are all having a terrific day and stay tune for more delicious post. i just made some lemon curd about 2 weeks ago, i really love that, it's my 3rd time making that and thanks for sharing the recipe on the strawberry curd! I haven't heard of strawberry curd before! What a wonderful idea!I gotta try making some soon!